Many of the flashlights discussed/reviewed/modded in Budget Light Forum (BLF) use Lithium-ion rechargeable batteries. Use of Lithium-ion batteries does introduce some risks, and requires more precautions than alkaline batteries. But like any tool, when used properly, the risks can be managed and reduced. This post outlines safety precautions for users that are new to Lithium-ion batteries. It does not attempt to provide a complete tutorial on Lithium-ion batteries nor the technical reasons for Li-ion dangers. It is intended as a starting point. There will always be some disagreement about safety rules. Some of these safety rules may not apply to those of you who were lab assistants for Dr. Goodenough, but hopefully they are appropriate for newer users. You have to be aware of your knowledge and experience level. Lithium-ion rechargeable batteries can be safely used when used properly. Lithium-ion rechargeable batteries can be dangerous when improperly used. Saving a few pennies on what may be questionable batteries is not worth it. Some cheaper batteries may be counterfeit or may be recycled/reclaimed. A QA story from a BLF member. Experienced users do harvest batteries from battery packs. Wait until you have more experience with Li-ion before attempting. Buy a quality battery charger. This is another place not to go the cheap route. Read the reviews. Buy a brand name with a good review. Independent channels so you can charge different battery types or discharge levels at the same time. User interface that gives you what you like. Indicator lights vs. LCD display. The charger should charge at 4.2V +/- 0.05V, but the battery may come off at a different voltage. Buy and use a multi-meter. Many like Digital Multi-Meters (DMM). Learn to check your Lithium-ion batteries voltage. Note: Not everyone agrees you need a DMM, but many people do recommend them. Don’t over charge your batteries. Max voltage should be 4.2V. Only charging to 4.1V may give you more recharge cycles. A good battery charger helps prevent over charging. Battery chargers may charge +/- 0.05V and still be in tolerance. After charging check your battery's voltage with your DMM after a short (~5 min) rest. Don’t over discharge your batteries. Batteries are depleted when they reaches 2.7-3.0v. Recharge. Batteries begin to suffer damage if discharged to 2.5 volts. 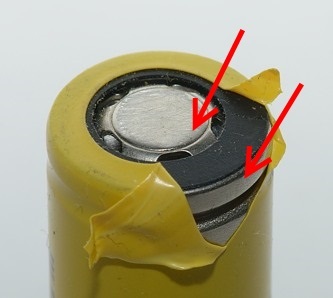 Batteries should be discarded if they discharge to 2.0 volts. Don’t let your batteries get too hot. If you are going to store your flashlight in your car in the summer, primary batteries are recommended over Lithium-Ion rechargeable batteries. High temperatures degrade cells faster, but as long as the temp is less than 60*C (140*F) there is probably not a safety issue. When not in a flashlight, batteries should always be in a protective carrier. This protects from shorting and physical damage. Never carry loose batteries in your pocket or bag. Don’t use batteries with physical damage. A battery with a damaged wrapper is easily shorted. Protected batteries are generally safer than unprotected batteries. Protected batteries have a circuit built in which protects from over-charging and over-discharging. Protection circuits increase the length and width of the battery slightly. Protected batteries won’t fit in all flashlights. Know your flashlight. Some flashlights have low voltage protection and will cut off at low voltage. Know your flashlight. Some high draw flashlights will trip the protection circuit in a protected battery and require unprotected batteries. Know your flashlight. Multi-battery flashlights have higher risk than single-battery flashlights. If just starting out you may want to limit yourself to single-battery flash lights. are charged to the same voltage. You may want to mark the batteries so you can use the same set together over time. Charge batteries in a location where there are not flammable materials. Put your charger on a counter, not on your sofa. Check them periodically to make sure they are not getting hot. Warm is ok. Note: there are different opinions on how often you need to check. 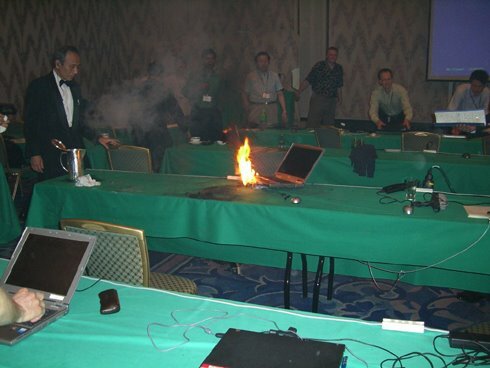 Damaged batteries can cause fires! "Abuse conditions such as overcharge, over-discharge and internal short-circuits can lead to battery temperatures far beyond the manufacturer ratings. At a critical temperature, a chain of exothermic reactions can be triggered. The reactions lead to a further temperature increase, which in turn accelerates the reaction kinetics. This catastrophic self-accelerated degradation of the Li-ion battery is called thermal runaway.2"
"During thermal runaway, temperatures as high as 900 °C can be reached,3 and the battery can release a significant amount of burnable and (if inhaled in high concentrations) toxic gas.4"
In the event of a Lithium-ion battery fire seek medical attention immediately. Burning or venting Lithium-ion batteries produce hydrogen fluoride.Symptoms from hydrogen fluoride injuries are not immediately apparent. "the battery can release a significant amount of burnable and (if inhaled in high concentrations) toxic gas.4"
Seek medical attention immediately. Don’t wait until you experience symptoms. There are mixed opinions on using magnets to create button-tops from flat-top batteries. Keep batteries out of the reach of children and pets. When swallowed, these small batteries get stuck in the esophagus (throat). The saliva triggers an electric current which causes a chemical reaction that can severely burn the esophagus in as little as two hours. A serious issue for children and pets. Primarily an issue with button batteries, but potential exists with all batteries. Please let me know what I've missed or what I've gotten wrong. Battery technology changes rapidly. Please check the edit date below. Thank you Jack! Post has been updated. I’d recommend putting citations to sources behind the statements. These batteries are “evolving” rapidly and the age, and source, for each belief is important to have on record. I don’t mean you have to be responsible for pointing to the best source — just point to where you found what you felt reliable information, so people can go from there. And for some reason, the statement, “Protected batteries are safer than unprotected batteries,” irks me. Just a style issue. I would have phrased it, “Protected batteries are generally safer than unprotected batteries.” That’s because there are so many exceptions where unprotected batteries are as safe or safer than protected batteries. For example, PCB’s have been known to fail in multi-cell applications. Or the most simple example of a high quality unprotected cell versus a low quality protected cell. But I’m getting picky. Edit: Oh wait, as long as we’re allowed to be ‘picky’ here, it should be cell/cells rather than battery/batteries. Is it normal for liIon cells to get a bit warm whist charging? I’ve never felt any of mine go above ambient. Oh wait, as long as we’re allowed to be ‘picky’ here, it should be cell/cells rather than battery/batteries. And not to be a knob,but what’s the difference? That’s one thing I’ve never seen explained. Margir af vasaljós rætt / umsögn / modded í Budget Light Forum (BLF) nota litíum-ion rafhlöður. Notkun litíum-jón rafhlöður er að kynna nokkrar áhættu, og krefst meira en Varúðarráðstafanir alkaline rafhlöður. En eins og allir tól, Þegar það er notað á réttan hátt, áhættan er hægt að stjórna og minnka. Þessi færsla lýsir Öryggisráðstafanir fyrir notendur gerðu eru að litíum-rafhlöður. Það þýðir ekki að reyna að afla a heill einkatími um rafhlöður litíum-né tæknilegum ástæðum Li-jón hættum. Það er ætlað sem útgangspunkt. Það verður alltaf einhver ágreiningur um reglur um öryggi. Sumir reglur ritgerð um öryggi kann ekki við Þeir sem voru Lab aðstoðarmenn til Dr. Goodenough (hlekkur er ytri), en vonandi Þeir eru viðeigandi fyrir nýrri notendur. Þú þarft að vera meðvitaðir um þekkingu og reynslu þína. Lithium-jón hleðslurafhlöðum er óhætt að nota þegar notað á réttan hátt. Lithium-jón hleðslurafhlöðum getur verið hættulegt Þegar óviðeigandi notuð. Kaupa góða rafhlöður. Saving nokkrar smáaurarnir á hvað getur verið varasamt rafhlöður er ekki þess virði. Sumir ódýrari rafhlöður geta verið fölsun eða kunna að endurvinna / endurheimta. https://batterybro.com/blogs/18650-wholesale-battery-reviews/18852875-re... (Link er ytri) http: //www.theepochtimes.com/n3/1421555-chinas-sloppy-battery-industry-t … (tengill er ytri) Reyndir notendur gera uppskeru rafhlöður frá rafhlaða bakpoki. Bíddu þar til þú hefur meiri reynslu af Li-jón áður en þú reynir. http://budgetlightforum.com/node/32720 Rafhlaða umsagnir. http://budgetlightforum.com/forum/batteries/rechargeable/reviews http://budgetlightforum.com/forum/batteries/rechargeable http://www.lygte-info.dk/info/indexBatteriesAndChargers%20UK.html (tengill er ytri) Kaupa gæði hleðslutæki. Þetta er annar staður að fara ekki ódýr leið. An undir sig klefi geta vera öruggur í góðu hleðslutæki en ekki klefi er öruggt í fátækum hleðslutæki. (SawMaster) Lestu umsagnir. Kaupa vörumerki með góðu endurskoðun. Atriði sem þarf að íhuga: Overcharge vernd. Reverse pólun vernd. Sjálfstæðum rásum svo þú geta ákæra öðruvísi rafhlaða tegundir eða útskrift stigum á Sametime. Notendaviðmót gerði gefur þér það sem þú vilt. Gaumljós vs LCD skjá. Hleðslutækið shoulderstand gjald á 4.2V +/- 0.05V, en rafhlaðan getur komið burt á mismunandi spennu. http://budgetlightforum.com/node/45344 Charger umsagnir. http://budgetlightforum.com/forum/batteries/chargers/reviews http://budgetlightforum.com/forum/batteries/chargers http://www.lygte-info.dk/info/indexBatteriesAndChargers%20UK.html (tengill er ytri) Kaupa og nota multi-metra. Margir eins og stafrænn multi-metra (DMM). Lærðu að athuga litíum þitt ion rafhlöður spennu. http://www.lygte-info.dk/info/Measurement%20UK.html (tengill er ytri) Athugið: Ekki allir sammála þú þarft DMM, en margir mæla með þeim. Hleðsla / afhleðsla Rafhlöður má greiða á: 0 * C – 45 * C (32 * F – 113 * F) Rafhlöður má tæmd á -20 * C – 60 * C (-4 F * – 140 * F) http: //batteryuniversity.com/learn/article/charging_at_high_and_low_temp … (tengill er ytri). Ekki overcharge ekki rafhlöður. Max spenna shoulderstand vera 4.2V. Aðeins hleðslan 4.1V getur gefið þér fleiri endurhlaða hringrás. Góð hleðslutæki kemur í veg fyrir yfir hleðslu. Rafhlaða hleðslutæki heimilt að innheimta +/- 0.05V og enn vera í umburðarlyndi. http://budgetlightforum.com/node/45344 Eftir hleðslu athuga spennu rafhlöðunnar þinnar með DMM þitt eftir stuttan (~ 5 mín) hvíld. http://batteryuniversity.com/learn/article/charging_lithium_ion_batteries (tengill er ytri) Ekki overdischarge ekki rafhlöður. Margir kjósa að endurhlaða rafhlöður Þegar þeirra ná 3.5- 3.6V Rafhlöður eru tæma Þegar þeir Nær 2.7-3.0v. Endurhlaða. Rafhlöður byrja að þjást skemmdir ef losað í 2,5 volt. Rafhlöður ætti að farga Ef þeir liggja að 2,0 volt. Ekki hlaða ekki rafhlöður Þegar hitastigið er undir frostmarki. (0 * C / 32 * F) Ekki láta rafhlöður fá of heitt. Ef þú ert að fara að geyma vasaljós í bílnum í sumar, eru fyrst og fremst rafhlöður mælt yfir litíum-jón hleðslurafhlöðum. Hátt hitastig draga frumur hraðar, en svo lengi sem afleysingamanneskja er minna en 60 * C (140 * F) það er sennilega ekki öryggi tölublað. http://budgetlightforum.com/node/42497 http: //batteryuniversity.com/learn/article/charging_at_high_and_low_temp … (tengill er ytri). Fyrir langtíma geymslu (mánuðir) það er best að geyma að minnsta 40-50% getu. (3.77-3.87V) http://batteryuniversity.com/learn/article/how_to_store_batteries (tengill er ytri) Þegar það er ekki í vasaljós, rafhlöður shoulderstand alltaf vera í hlífðar burðarefni. Þetta ver frá shorting og líkamlegum skaða. Aldrei bera lausa rafhlöður í vasa eða tösku. https://www.youtube.com/watch?v=k1LjSuq0rk8 (hlekkur er ytri) <== Ekki nota rafgeyma með líkamlegum skaða. Vernduð rafhlöður eru gen fylkja öruggari en varnarlausa rafhlöður. Vernduð rafhlöður hafa hringrás innbyggður í sem ver frá yfir-hleðslu og yfir-sinnt. Verndun hringrás auka lengd og breidd á rafhlöðunni örlítið. Vernduð rafhlöður mun ekki passa í allar vasaljós. Vita vasaljós. Sumir vasaljós með lág spenna verndun og mun skera burt á lágu spennu. Vita vasaljós. Sum hár Draw vasaljós mun ferð verndun hringrás í rafhlöðu verndað og varnarlausa þurfa rafhlöður. Vita vasaljós. Multi-rafhlaða vasaljós hafa meiri hættu en einn rafhlaða vasaljós. Ef bara að byrja út að þú vilt kannski að takmarka sjálfur til einn rafhlaða vasaljós. Þegar þú notar multi-rafhlaða ljós, að draga úr líkum á ójöfnu rennsli milli rafhlöður, það er mikilvægt gerði öllum rafhlöður: eru þau sömu tegund, eru þau sömu framleiðslu, hafa sömu getu (Ah) eru innheimt á sama spennu. Þú vilt kannski að merkja rafhlöður svo þú-getur notað sama mengi saman yfirvinnu. Hlaða rafhlöður í stað þar sem það eru ekki eldfim efni. Setja hleðslutækið þitt á borðið, ekki á sófanum þínum. Aldrei láta hlaða rafhlöður eftirlitslaus. Athugaðu þá reglulega til að ganga úr skugga um að þeir eru ekki að fá heitt. Warm er allt í lagi. Ath: það eru mismunandi skoðanir um hvernig oft þú þarft að athuga. http: //www.local10.com/news/local-10-investigates/lithium-ion-battery-bu … (tengill er ytri) Skemmd rafhlöður geta valdið eldsvoða! Í the atburður af a litíum-jón rafhlaða bruna leita læknis strax. Burning eða loftun litíum-jón rafhlöður framleiða vetni úr vetni flúoríð fluoride.Symptoms meiðsli eru ekki strax í ljós. “The rafhlaða getur losað umtalsvert magn af burnable og (ef andað í háum styrk) eitrað gas.4” (tengill er ytri) Royal Society of Chemistry http://pubs.rsc.org/en/content/articlehtml/2013/ra/c3ra45748f~~HEAD=pobj (tengill er ytri) Leitið læknis strax. Ekki bíða þangað til þú finnur fyrir einkennum. http: //www.candlepowerforums.com/vb/showthread.php 141137 andað-gufur … (tengill er ytri) !!!? Það eru blönduð skoðanir á með seglum að búa button-boli úr íbúð-toppur rafhlöður. Ekki fá rafhlöður blautur. Ekki brenna rafhlöður. Farga skal rafhlöðum almennilega. Það er ekki óhætt að borða Lithium-Ion rafhlöður. Litany fyrir byrjendur: http://budgetlightforum.com/comment/904373#comment-904373 Leita staða fyrir “öryggi” – http://budgetlightforum.com/node/26665 Li-jón Rafhlaða Safety og Shopping Guide – http://budgetlightforum.com/node/16699 Li-jón Safety Áhyggjuefni – http://batteryuniversity.com/learn/article/lithium_ion_safety_concerns (tengill er ytri) Lithium undirstaða rafhlöður – http://batteryuniversity.com/learn/article/lithium_based_batteries (tengill er ytri) Tegundir Lithium Ion – http://batteryuniversity.com/learn/article/types_of_lithium_ion~~pobj (tengill er ytri) Vinsamlegast láttu mig vita hvað ég hef misst eða hvað ég hef fengið rangt. Rafhlaða tækni breytist ört. Vinsamlegast athugaðu dagsetninguna breyta neðan. Ég givin ‘henni allt sem hún fékk, Captain! Who else wants to rock Google Translate for a few minutes? La plupart des discussions/tests/modifications sur le forum BudgetLightForum (BLF) concernent des lampes de poche qui utilisent des batteries Lithium-ion rechargeables. L’utilisation de batteries Lithium-ion implique des risques, et requière plus de précautions que les batteries alcalines. Mais comme tout outil, lorsque qu’elles sont utilisées correctement, les risques peuvent être réduits et maîtrisés. Ce sujet souligne les précautions de sécurité pour les utilisateurs qui sont novices dans l’utilisation de ces batteries. Il ne s’agit pas d’un tutoriel complet sur les batteries Lithium-ion, ni d’explications techniques du danger de ces batteries. Il s’agit d’un point de départ. Il y aura toujours des désaccords au sujet des règles de sécurité. Certaines de ces règles peuvent ne pas s’applique à ceux d’entre vous qui ont été assistants de laboratoire pour le “Dr Goodenough”:https://en.wikipedia.org/wiki/John_B._Goodenough , mais elle sont pertinentes pour les utilisateurs les plus novices. Vous devez être conscients de votre niveau de connaissance et d’expérience. Les batteries Lithium-ion rechargeables correctement utilisées peuvent être sûres. Les batteries Lithium-ion utilisées de façon inadéquate peuvent être dangereuses. Achetez des batteries de qualité. Economiser quelques centimes dans ce qui pourrait être des batteries douteuses ne vaut pas le coup. Certaines batteries moins chères pourraient être contrefaites ou de récupération. Attendez d’avoir un peu plus d’expérience avant d’essayer cela. Achetez un chargeur de qualité. Un deuxième sujet à ne pas négliger. Lisez les essais/tests. Achetez un chargeur de qualité d’une marque reconnue avec de bons avis. Des canaux indépendants pour pouvoir charger et décharger des batteries de différents type en même temps. Une interface utilisateur qui vous indique ce que vous voulez savoir. LED d’indication ou écran LCD. Le chargeur doit charger à 4,20V +/- 0,05V, mais The charger should charge at 4.2V +/- 0.05V, but the battery may come off at a different voltage. Achetez et utilisez un multimetre	. Beaucoup préfèrent un multimetre à affichage LCD (DMM). Apprenez à vérifier la tension de vos batteries Lithium-ion. Nota : l’utilité d’un multimetre ne fait pas l’unanimité, mais beaucoup de personnes les recommandent. Ne surchargez pas vos batteries. La tension maximum doit être 4.2V. Ne charger que jusqu’à 4.1V allongera la durée de vie de la batterie. Un bon chargeur de batteries aide à éviter la surcharge. Les chargeurs de batteries peuvent charger à +/- 0.05V et être dans les tolérances quand même. Après la recharge, verifiéz la tension de vos batteries avec votre multimètre après 5min de repos. Une batterie est vide lorsqu’elle atteint 3,0V il faut alors la recharger. Une batterie commence à se dégrader si elle atteint 2,5V. Une batterie qui a atteint 2,0V doit être recyclé (ne pas l’utiliser). Ne laissez pas vos batteries devenir trop chaudes. Si vous voulez stocker des batteries dans votre voiture l’été, choisissez des piles non-rechargeables au Lithium à la place des batteries. Les hautes températures dégradent les batteries plus vite, mais en dessous de 60°C il n’y a probablement pas de risque. Lorsqu’elles ne sont pas dans une lampe de poche, les batteries devraient être stockées dans des boites de protection/transport. Cela les protège contre les courts-circuits et les chocs. Ne transportez jamais de batteries librement dans votre sac ou vos poches. N’utilisez pas une batterie physiquement endommagée. Les batteries protégées sont en général plus sûre que les batteries nues. Les batteries protégées sont équipées d’un circuit qui les protège contre la surcharge et la décharge excessive. Le circuit de protection accroît la longueur de la batterie, et son diamètre. Les batteries protégées ne logent pas dans toutes les lampes de poche. Vérifiez vos lampes, sachez lesquelles sont compatibles. Certaines lampes de poche ont une protection contre les tensions basses (pour protéger vos batteries). Connaissez vos lampes de poches ! Certaines lampes à fort courant peuvent déclancher le circuit de protection de votre batterie, et nécessitent donc une batterie non protégée. Connaissez vos lampes de =poches ! Les lampes de poches à plusieurs batteries comportent plus de risques que les lampes à une seule batterie. Si vous débutez juste, il est judicieux de commencer par des modèles à une seule batterie. L’idéal est de marquer vos batteries pour être sûr d’utiliser toujours les mêmes ensemble. Chargez vos batteries dans un endroit qui ne comporte pas de matière inflammable. Placez le charger sur un meuble, pas dans votre canapé ! Ne laissez jamais des batteries en charge sans surveillance. Vérifiez les régulièrement pour être sûr qu’elles ne chauffent pas trop. Tiède, c’est normal, brûlant non ! Nota : il y a différents opinions sur la fréquence de ces vérifications. Une batterie endommagée peut provoquer un incendie ! Au cours de l’emballement thermique , des températures jusqu’à 900 ° C peuvent être atteintes, et la batterie peut libérer une quantité importante de combustible et ( en cas d’inhalation dans des concentrations élevées ) des gaz toxiques. Dans le cas d’un incendie impliquant des batteries lithium-ion, consultez un médecin immédiatement. Brûler ou ouvrir une batterie lithium-ion produit du fluorure d’hydrogène. Les symptômes dûes à l’exposition au fluorure d’hydrogène ne sont pas immédiatement vissibles. Consultez immédiatement un médecin. N’attendez pas de ressentir des symptômes. Il y a différentes opinions concernant l’usage d’aimants pour créer un contact “bouton” sur un contact “plat”. Ne mouillez pat vos batteries. Ne brûlez pas de batteries. Recyclez vos batteries de façon responsable (points de collecte). Il n’ets pas recommandé de manger des batteries Lithium-ion, en cas de grosse faim, pensez aux piles Alcaline. Great info, looks pretty complete and easy to read. “Don’t over charge your batteries. Maybe explain that most chargers have a tolerance of 1%, so for instance 4.22 volts is not a problem. Hate to see new members obsess over .02-.04 volts. Also all voltages should be measured after a short “rest period” and not instantly after coming off charger. I’d recommend putting citations to sources behind the statements. These batteries are “evolving” rapidly and the age, and source, for each belief is important to have on record. I don’t mean you have to be responsible for pointing to the best source — just point to where you found what you felt reliable information, so people can go from there. Thanks for the comment. References are good. Unfortunately I’ve been copy-and-pasting things into a word file as I came across them and haven’t been saving the references. I will attempt to find as many citations as I can. Done and done. Thank you! Picky is fine. If you still have the original text you copied and pasted, just paste a chunk of it back into a Google search as a quoted string; likely it’ll take you right to where it first appeared. If not, at least, going forward, it’s easy to capture the source URL as well as the words you want, which will help as this evolved. This should absolutely be a sticky. Curiosity killed the cat……But I’m not a cat…..
What is “short” with respect to “a short rest period”? As a newbie that is one of my first thoughts. A few minutes should be fine for accurate voltage measuring. Wait until the cells cool down to use them in their respective device. You’re right. I was thinking Short being 5 minutes. Sorry I did not include an actual time frame. 1% tolerance in this case would be .042 volts so yes near .05 volts would be a reasonable variance. Members should also realize that the health and even size of a cell can also effect voltage termination values. My experience has shown that many times a smaller cell such as a 16340 may end charging at 4.17- 4.18 where as a normal 18650 on the same charger would come off at 4.20-4.22. So if the user only were to try the 16340 cell they may think there is something wrong with the charger when this is not the case. As in many things in life you are looking for a suitable safe range and not an absolute value on each and every cell. I agree with your recommendation that the user chose a good name brand charger and not just an unmarked charger. Well done, I am in awe that you took the time to do this, and I think that it has the potential to save an unknown number of li-ion battery users a whole deal of time/grief/injury. I have some thoughts. What I am going to say comes from having worked with many people who are new to the field I work in and trying to be more effectively informative without wasting time or coming across as condescending. 1. Delete the first two paragraphs. You do not need to excuse yourself for trying to save people bodily injury. Acutely, the first paragraph could be a few pictures of people that have suffered such injuries due to the improper care of li-ion cells, although that may come across as offensive or heavy-handed to many. I think a quick explanation of the dangers of li-ion cells followed by a brief explanation of what is contained in the guide would suffice as a more pleasant alternative to that, but getting to the point quickly and concisely, especially in a thread designed on promoting safety, is important. 2. The section on a lithium battery fire is not substantially alarming. It needs to be much more of a noticeable bullet point. I’ve seen several “venting with flame” claims by manufacturers that seem to have the intention of assuring the customer that no real danger is present. The chemicals released during a li-ion fire are bad enough that medical attention is necessary immediately instead of the next day to prevent chronic problems. I think you did a bang up job on this and I appreciate how much work it is to put something like this together, and I thank you for doing it. Kudos to you Mr. Scott. This thread is posted in the “Rechargeable Batteries” category not the “Rechargeable Cells” Category. HKJ only seems to review batteries, not cells. That is a lot of editing for this post. Picky, picky, picky. “Cells” and “batteries” are generally understood to be the same thing by the average person, though when being picky there is a difference. In this context I’d say the terms are understandable and interchangeable- remember the audience and address them as they will best understand. When addressing noobs I usually put something like this: batteries (cells). On the preambles, yes do shorten them. Simply say the guide is aimed toward the novice users and is not meant to cover every aspect of LiIon rechargeables but only to provide a general guide which will allow their safe use. On chargers add more emphasis to the absolute need for known safe chargers. An under-performing cell can be safe in a good charger but no cell is safe in a poor charger. On the dangers of cheap cells, add or link to venting with flame vids and pics; be graphic about how serious these dangers can be. Also add something more on not breathing the fumes at all as this is probably the most potentially harmful aspect of most venting episodes. And I’m looking forward to seeing this get “stickied” and referred to regularly- it deserves no less! Yep. combustion of the components is what produces hydrogen fluoride, and that’s the delayed-injury problem doctors need to think about. This should be translated so as much nationalities can read up. Please other Dutchies, give me some corrections for grammer or wrongfully put scentences, being King Typo, surely there are many. Deze post geeft een overzicht van veiligheid maatregelen voor gebruikers die nieuw zijn in het gebruik van Lithim-ion batterijen. Dit is geen compleet overzicht over Lithium-ion batterijen en geeft geen technische redenen van Li-ion gevaren. Het is bedoeld als begin punt. Er zal waarschijnlijk altijd wel wat onenigheid zijn over de veiligheidsregels. Sommige van deze veiligheid regels kunnen niet van toepassing zijn voor mensen die lab assistenten waren van Dr. John Goodenough, maar hopelijk zijn ze goed te gebruiken door nieuwere gebruikers. Je dient je bewust te wezen van je kennis en ervaringsniveau. Lithium-ion oplaadbare batterijen kunnen veilig zijn als ze goed gebruikt worden. Lithium-ion oplaadbare batterijen kunnen gevaarlijk zijn als ze niet goed gebruikt worden. Een paar centen besparen door batterijen van wellicht mindere kwaliteit te kopen is het niet waard. Sommige goedkopere batterijen kunnen namaak zijn, of hergebruikt en dus een oude of slechte batterij herbergen onder de mooie nieuwe plastic buitenlaag. Ervaren gebruikers kunnen batterijen uit andere apparatuur winnen, zoals notebooks. Wacht met deze praktijken tot je ervaring hebt en de juist apparatuur voor je dit zelf proberen gaat. Koop en gebruik een goede oplader. Ook hier is het belangrijk niet de goedkoopste route te bewandelen. Lees de reviews, en koop een merk batterij met een goede review. Onafhankelijke kanalen zodat je verschillende type batterijen of batterijen die niet gelijk zijn ontladen an opladen op hetzelfde moment. Hoe communiceert de lader met je, bijvoorbeeld met indicatie lampjes of een LCD scherm. De lader moet laden met 4.2V +/- 0.05V, maar de batterij mag met een iets andere lading klaar zijn met laden. Koop en gebruik een multi meter. Leer het voltage van je Lithium-ion oplaadbare batterijen te controleren. Niet iedereen is van mening dat een DMM noodzakelijk is, maar de meesten zijn wel deze mening toegedaan. Overlaad geen batterijen. het maximale voltage mag 4.2V zijn. Een goede lader zal beschermen tegen overladen. Sommige laders kunnen +/- 0.05V laden en dat is binnen de marge. Na het laden controleer het voltage van je Lithium-ion oplaadbare batterijen met je DMM na een korte rustperiode van ~5 min). Velen zullen hun batterijen opladen als ze 3.5- 3.6V bereikt hebben. Een Lithium-ion oplaadbare batterij is uitgeput/ontladen als deze 2.7-3.0V bereikt. Herladen. Lithium-ion oplaadbare batterijen lopen schade op als de ontladen zijn tot 2.5 volts. Een Lithium-ion oplaadbare batterij moet worden afgechreven (afgegeven recycle punt) als deze ontladen is tot 2.0 volts. Laat Lithium-ion oplaadbare batterijen niet te heet worden. Als je een zaklamp in de auto wilt bewaren in de zomer, gebruik dan niet oplaadbare batterijen. Hoge temperaturen zorgen voor slijtagedegradatie van de batterijen. Echter, zolang de temperatuur minder is dan 60*C (140*F) zal er waarschijnlijk geen veiligheidsrisico wezen. .
Bewaar Lithium-ion oplaadbare batterijen altijd in een beschermende behuizing (zoals een plastic goed passend doosje) als ze niet in een zaklamp zitten. Z o kunnen ze niet kortsluiten of beschadigen. Draag geen losse Lithium-ion oplaadbare batterijen in je zakken of tas. Gebruik geen Lithium-ion oplaadbare batterijen die uiterljke beschadigingen hebben. Over het algemeen zijn batterijen met bescherming (protected) veiliger dan Lithium-ion oplaadbare batterijen zonder bescherming (unprotected). Een beschermde (protected) batterij heeft electronica ingebouwd welke bescherming hoort te bieden tegen overladen en te ver ontladen. Deze beschermende onderdelen maken de beschermde batterij wel iets langer en dikker. Dus zullen beschermde batterijen niet in elke zaklamp passen, ken je zaklamp. En zijn zaklampen die een laag voltage bescherming hebben en zichzelf uitzetten als de batterij leeg begint te raken, ken je zaklamp. Sommige veel stroom gebruikende zaklampen zullen de bescherming van batterijen aan doen slaan en kunnen alleen werken met onbeschermde batterijen, ken je zaklamp. Zaklampen met meerdere batterijen lopen meer risico dan zaklampen met een enkele batterij. Als je nieuw bent in de zaklamp wereld, begin met een zaklamp die werkt op 1 Lithium-ion oplaadbare batterij. Als je zaklampen gebruikt met meerdere batterijen dan is het de bedoeling ze gelijk te laten ontladen en slijten en te voorkomen dat ze ongelijk zijn. geladen zijn tot hetzelfde voltage. Je zal ze willen markeren om ze te herkennen en gebruiken als een set. Doe dit op een plek zonder brandbare of licht ontvlambare materialen. Plaats de lader op een ij voorkeur stenen ondergrond en niet op de bank. Blijf in de buurt en laat de ladende batterijen niet onbeheerd. Voel regelmatig of de batterijen niet te het worden, wat warm is goed maar heet niet. Let op, er zijn verschillende meningen over hoe vaak te voelen beter te vaak dan te weinig. Beschadgde batterijen kunnen brand veroorzaken! Misbruik zoals overladen, te ver ontladen en interne kortsluitingen kunnen leiden tot een temperatuur die veel hoger ligt dan fabrikanten aangeven als veilig. Op een kritieke temperatuur kan er een ketting reactie ontstaan die exotherm is. Deze reactie zal tot nog hogere temperaturen leiden welke de (kinetische) reactie verder zal doen versnellen. Deze catastrofale zichzelf versnellende afbraak van de Lithium-ion batterij heet een thermal runaway. De temperatuur kan oplopen tot 900 °C. De Lithium-ion oplaadbare batterij ka een redelijk grote hoeveelheid brandbaar en giftig (als het de longen bereikt door inademen) gas produceren. In het geval van brand en ontsnappend gas zoek onmiddellijk medische hulp. Brandende of gas producerende Lithium-ion oplaadbare batterijen produceren hydrogen fluoride. “De batterij kan een flinke hoeveelheid brandbaar en (als ingeademd in hogere concentraties) giftig gas produceren. Zoek onmiddellijk medische hulp, wacht niet tot symptomen merkbaar worden. Lithium-ion oplaadbare batterijen zijn er zonder knop en met. Er zijn gemixte gevoelens om een magneetje te gebruiken om de batterijen zonder knoop bruikbaar te maken in zaklampen die er knop batterij nodig hebben. Houdt Lithium-ion oplaadbare batterijen droog. Verbrandt geen Lithium-ion oplaadbare batterijen. Dank ze correct af (een stukje plakband over de uiteinden en afgeven bij recycle punt of verzamelbak batterijen. Het is niet veilig om Lithium-ion oplaadbare batterijen te eten. Asked several BLFers to do a translation kiriba-ru is going to do it to Russian. Dank je wel The Miller! I’ve never been translated before. And hopefully more will come! You can brag your work has been translated in Russian, French, Dutch and who knows maybe/hopefully even more! I’ve added a link from the main post to your translation post so people can quickly jump down there. Now I guess if I update the main post I should PM you and let you know which section/lines were updated so you don’t have to try to scan the whole post to find it. I believe I’ve incorporated all the feedback (except the battery/cell – sorry David) so I don’t anticipate many more changes. But if anyone sees something please let me know. Well done, Mr. Scott, the pictures solidify the point of the thread as well as add authenticity to it. Well researched, well presented, and much needed as well! I’m really looking forward to watching this baby grow!